30 Learning Features in one spelling program make learning inescapable! 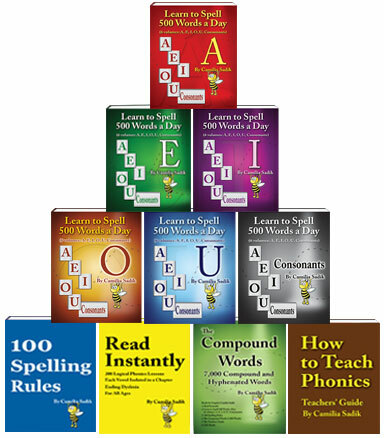 Exclusive 100 Spelling Rules applied in 600 Phonics Lessons in 10 Books for all Ages! 1. All words are divided into syllables. 2. All silent letters are italicized. 5. We inject a logical explanation or a spelling rule at the beginning of every one of our 600 phonics lessons. 6. Children and adults with a logical learning style can now understand when to spell a sound one-way and not the other. 7. Nearly all the words that share the same sound and spelling pattern, which follow a specific rule are grouped together. 8. Each vowel is dissected and isolated in a book. 9. Comprehensive wordlists! Nearly all words that share the same sound and spelling pattern and follow a specific rule are grouped together and listed on a few pages. 10. The words are then used in nonsensical stories for extra practice. 11. Comparison lists, as in the Knight that had good eyesight and Mike who went to the school’s site. 12. Comprehensive comparison lists, as in Comparing short ĭ with long ī in sit, site, bit, bite, kit, kite, dinner, diner, etc. 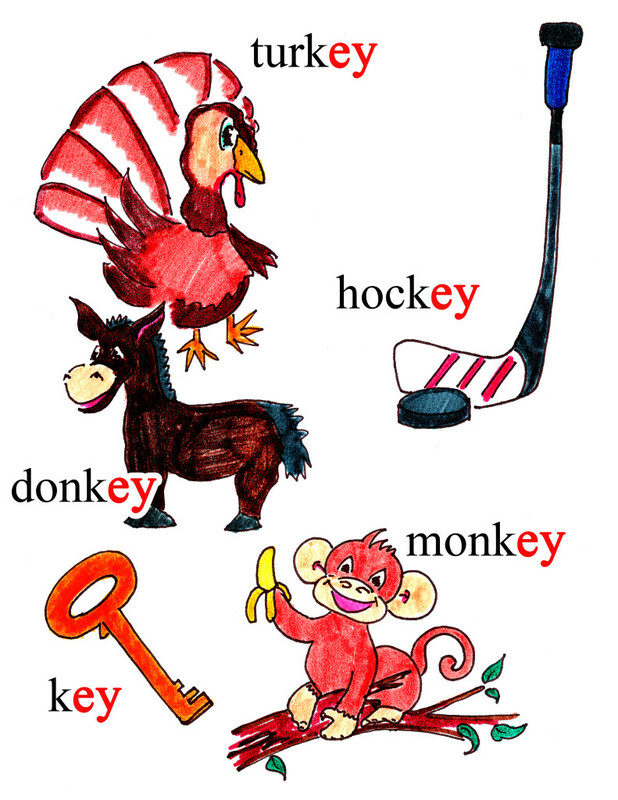 The monkey, turkey, and donkey played hockey in Turkey with the disk jockey that had a key to the zoo. Rickey who is a jockey at the racetrack laughed at this malarkey. 14. Eight Inconsistent Consonants: Similar to vowels, eight of the c, g, h, q, s, x, w, and y are also inconsistent. The sixth volume in the Learn to Spell 500 Words a Day series is about eight consonants that have 50 sounds, which are spelled in 60 spelling patterns. 15. Students Reading Aloud Approach (S-RAA) was developed and class-tested. Applying the S-RAA enables learners to memorize naturally, through senses, and without forced memorization. When reading aloud, learners are using more senses than just seeing the words. They see the word, hear the word, and feel it in their mouths as they utter it. Reading aloud is vital and there is more about it in the How to Teach Phonics – Teachers’ Guide. 16. The Reading Slowly Approach: Reading slowly gives students enough time to see the way words are spelled. It also helps them slow down to recover from dyslexia in spelling and in writing letters in reverse. 17. New Concepts Used into the English language, like semivowels, and occasionally, an existing concept like phonics is alienated from its traditional meaning and granted a new meaning. 18. A phonic is a single sound produced by two or more letters, like tion in nation. One letter that does not sound like its letter is also a phonic, like the y in sky. 19. The 26 English letters produce more than 90 sounds we call phonics, which are spelled in approximately 180 different ways we call spelling patterns. These different spelling patterns need to be taught or learned. Native-English speakers already know how to say the phonic tion as in nation, and the vast majority of them know how to read it in words. 20. The l, m, n, r, and s are semivowels, and sometimes they can act like vowels. 21. While there is no known measuring stick to gauge short or long words, we saw the need to set the standards to measure words’ sizes as short, medium or long. 22. Millions of adults and children are confused and have had to suffer from poor spelling not knowing the reason behind their poor spelling. Now we know the reason is that a single English sound can be written in a number of ways. 23. Millions of dollars are being spent on dyslexia without a solution to prevent or end dyslexia. Now we know that dyslexia in spelling ends after learning to spell and after slowing down to write words slowly. Furthermore, dyslexia can be easily prevented before the 4th grade. 24. Our 10 phonics-based spelling books are the only comprehensive phonics books. 25. Practically, the 26 letters are not the only ABC’s in English. The ABC’s should have been [26 letters + 180 spelling patterns of sounds we call phonics = 206 spelling patterns of the English sounds]. 26. All the prefixes with their meaning, followed by nearly all the words that share a specific prefix are in the last chapter in of the Consonants’ book. 27. All the silent letters are italicized and grouped in a chapter. 28. Over 5,000 compound words and 2,000 hyphenated words are isolated in a book. 29. Initially, all the sound and the spelling patterns of phonics are placed in queue in Read Instantly. Learners are always informed before introducing a spelling pattern of a sound. The order of introducing phonics in Read Instantly will someday eradicate illiteracy in English. 30. How students feel does count; they need to feel in control when using their first language. For instance, learning that the vowel A has five sounds makes them want to learn more. Furthermore, learning that the five sounds of A are spelled in 12 ways makes feel they can gain control over their own first language. Imagine how they feel after they see all the specifics about the vowel A and seeing easy practice lessons that contain all the sounds and spelling patterns in over 2,00 words! We help those who everyone else has give up on them: Encompassing that many unique learning features in one comprehensive program has made learning to read and spell inescapable for all ages and all types of learners. If one feature does not work for someone, the other 29 might work. Our phonics-based spelling books are a breakthrough; their magnitude is in their entirety. Act Now and obtain your own copies of our extremely rare books.